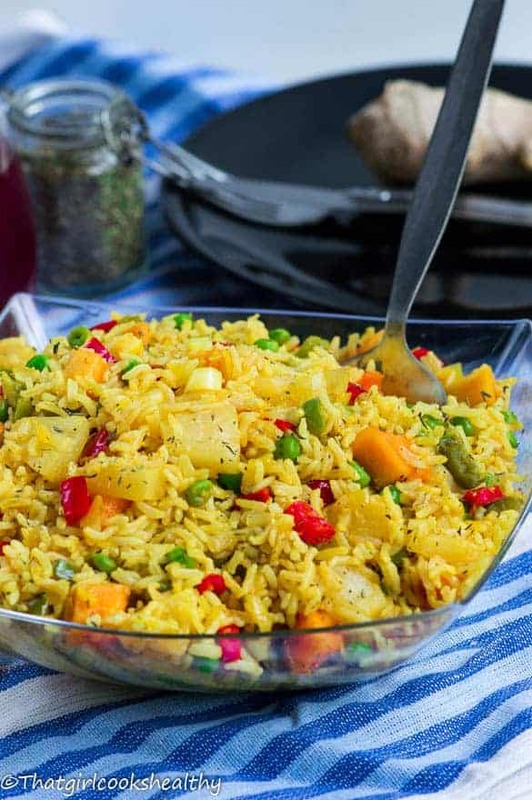 Thai pineapple fried rice – Rice lovers will go absolutely crazy for this Thai inspired fusion dish with an element of Caribbean flavours. 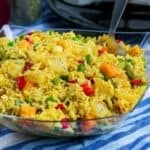 This Thai pineapple fried rice is my take on a favourite recipe of mine, yes I do like to eat other cuisines aside from Caribbean food. I’m certainly not a one trick pony, in fact I’d render myself as being well versed in the kitchen. There’s something heavenly when it comes to a delicious, one pot meal combined with exotic fruit and rice, I cannot quite put my finger on it yet. My Thai inspired recipe derived from a recent dining session that I had with a few close friends of mine. We went the whole 9 yard and ventured out Thai style. In my city, unfortunately, there isn’t a wide selection of Thai restaurants to choose from which is quite disheartening since I have a love for Thai cuisine. However I have noticed a few establishments popping up here and there, namely around the periphery of the city as opposed to being in the thick of all the action. I suppose for me that would mean exploring eateries more further a field and with my busy-on-the-go lifestyle I doubt I’ll have enough time to restaurant hop. Perhaps in an ideal world I could, for now I’ll settle for what’s localised. Rather than hunt for reasonable places to eat, what would to be a more viable option is to practice home style cooking. After all that’s what I’m here to assist you with? Let’s forgot spending £££$$ on fine dining and tap into your inner culinary skills. 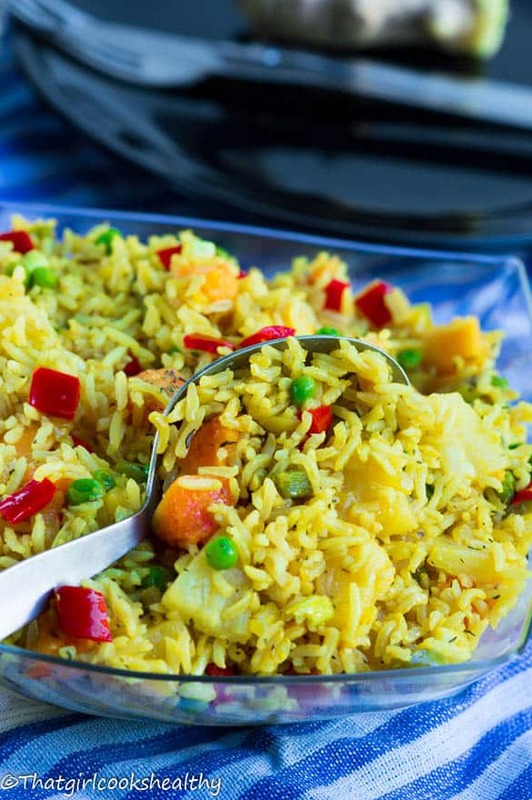 Today I’m going to talk you through how to make this wonderful exotic rice dish and impress your friends/spouse/hot date – you choose. I promise they’ll be back for seconds and no one will ever need to know Charla accredited youself with the recipe hookup (just send me a wedding invitation, if you’re making this for your hot date). Soak the rice – I soaked the organic brown rice overnight to release the starch and increase the digestibility of the grains, since sprouted grains aren’t a gluten free option. If you suffer from bloating and any other gastrointestinal difficulties due to grains, then soaking them for a long period time should aid breakdown. Furthermore, soaking grains help to unlock the nutrients inside too, that’s another added health bonus. 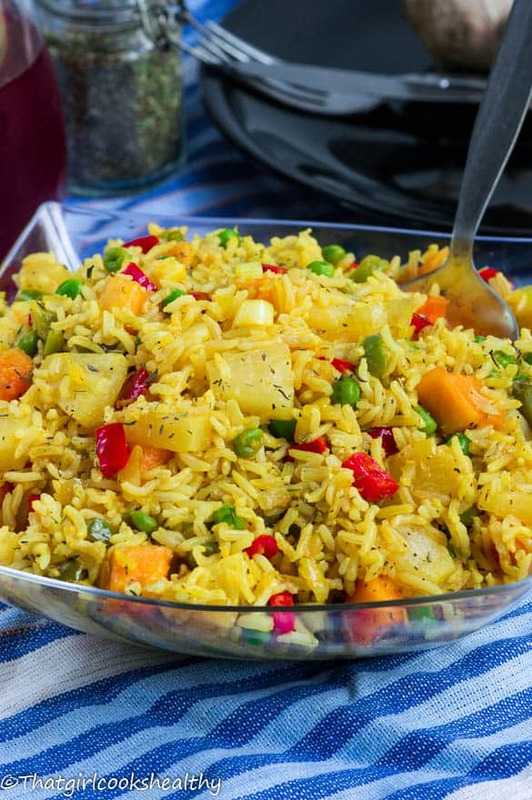 Cook the rice ahead of time – suggest you cook the rice for the pineapple papaya fried rice recipe before hand and allow to completely cool before transferring to the refrigerator. Here’s a tip, always use cold rice for stir fries because the texture of warm rice is too soft to work with. This meal is not only easy to pull together but a macronutrient (yields a slow release source of carb energy). 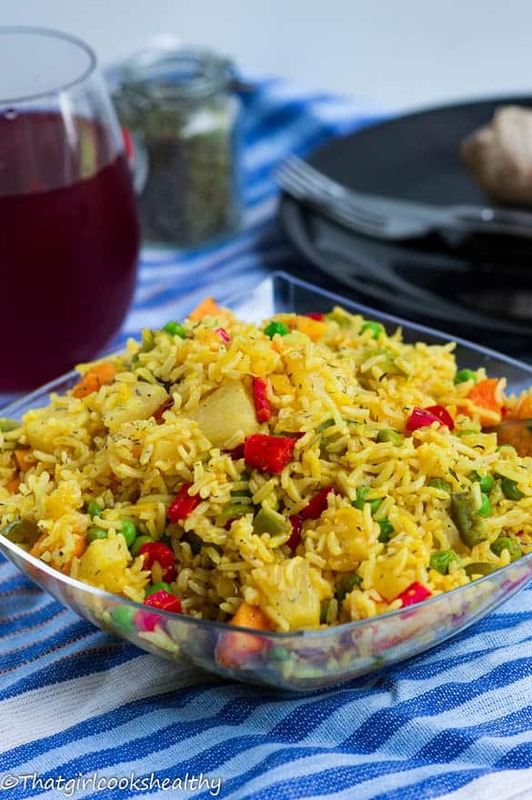 Rice fried with a medley of ingredients ranging from bell peppers, local organically grown garden peas, fresh papaya, pineapples – canned 100% in juice without any additives or preservatives. Also some more core ingredients for the recipe include – scallion, ginger, sesame oil, coconut aminos (alternative to soy) garlic. Side note, I added thyme which lent a herbaceous hint of the Caribbean. 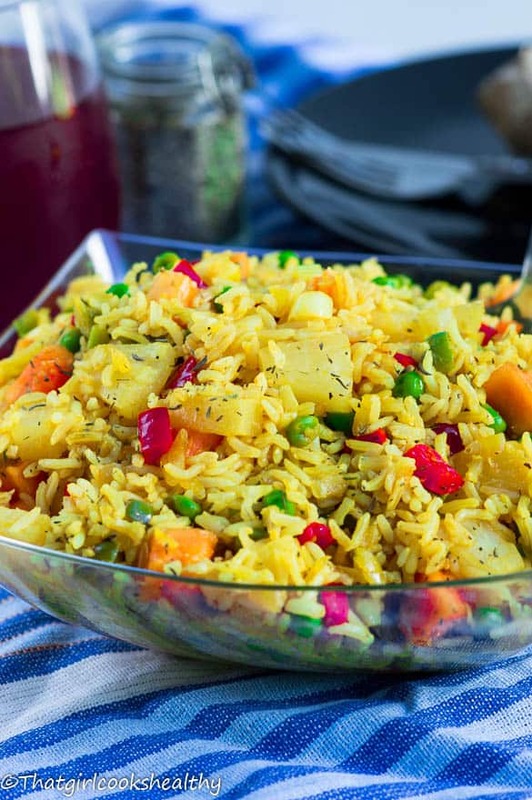 What other ingredients can you add to Thai pineapple fried rice? You can also add meat if you would rather make this into a non-vegan dish but I feel the recipe to hand is filling enough with all of the ingredients. Heat a large wok or heavy duty frying pan over medium heat for 30 seconds before proceeding to melt the coconut oil while rotating the pan. Add the turmeric first to release the flavour before adding in the onion, scallion, garlic and ginger. Saute until the onions are soft, this should take roughly one minute to achieve. Meanwhile pour in the bell peppers and garden peas, fold them into the sauteed onion mixture. Stir occasionally until the veggies are soft in texture. Now add the pineapple and papaya to the wok along with the cold rice. Combine, coat and stir the entire contents as it slowly begins to take on a yellow hue from the turmeric. Drizzle the coconut aminos and sesame oil into the wok and flip once or twice. Then season with thyme, white pepper, pink salt before stir thoroughly to deepen the flavour. 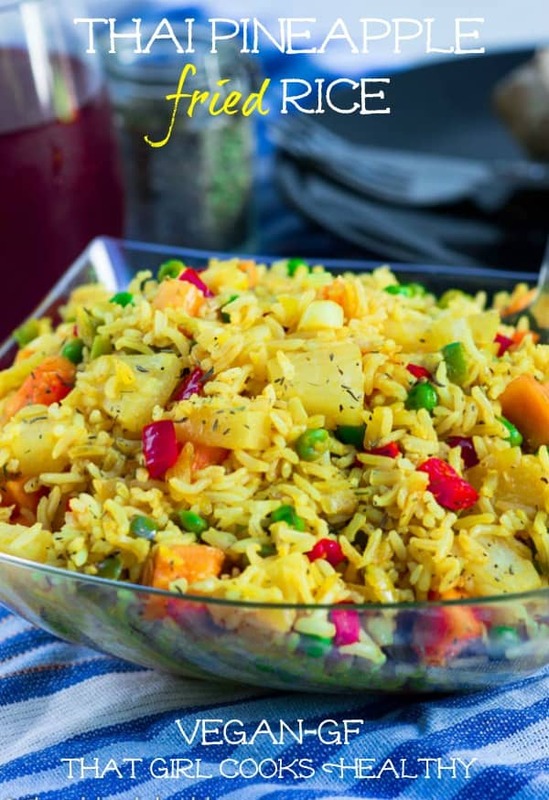 YUM this sounds so good, I love the idea of the pineapple and the papaya in the rice, I never would have thought to do that but I think I would LOVE it! Thanks Sam, yes you will definitely be pleasantly surprised with this recipe. The combination of fruit with savoury ingredients really works. oo I love this – I’m going to try and remix it for the 21-day fix! Thanks for the idea! Aww you are welcome Justin. Nice to hear that you and your two boys loved it.